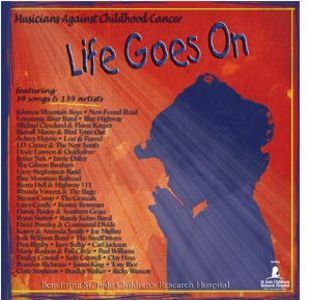 Nashville, TN -- Rural Rhythm Records is proud to announce the album Life Goes On by the Musicians Against Childhood Cancer® (MACC) received five International Bluegrass Music Association (IBMA) Award Nominations. The MMACC Life Goes On album was produced by Bob Kelley, Jack Campitelli, and Darrel Adkins. The single "Life Goes On", which was the only studio cut on the record, was produced by Jerry Salley, Carl Jackson, Randy Kohrs, Carl Jackson and Jim VanCleve. The title track, “Life Goes On” by Carl Jackson, Ronnie Bowman, Larry Cordle, Jerry Salley, Rickey Wasson, Randy Kohrs, D.A. Adkins, Garnet Bowman, Lynn Butler, Ashley Kohrs, Gary Payne, Dale Pyatt, Clay Hess, Alan Bibey, Jay Weaver, Ron Stewart, Jim VanCleve received a nomination for Recorded Event of the Year. “Beyond the Sunset” with Doyle Lawson, Russell Moore, Jamie Dailey & Josh Swift picked up two Nominations – Gospel Recorded Performance of the Year and Recorded Event of the Year. “Old Violin” by Larry Cordle & Michael Cleveland also received a nomination for Recorded Event of the Year making that 3 nods in the same category. “Manzanita” by Tony Rice, Josh Williams, Aaron Ramsey, Aubrey Haynie & Rob Ickes received a nomination for Instrumental Recorded Performance of the Year. Life Goes On has appeared several times on Billboard Magazine’s Top 15 Bluegrass Album Chart reaching as high as #4 earlier this month. The album and single, “Life Goes On”, have both appeared on numerous radio charts this year including reaching #1 on Cashbox Magazine, and charting on the Bluegrass Today Monthly and Weekly Charts, SiriusXM Bluegrass Junction's Most Played Tracks and Albums and more. Life Goes On was recorded live during the annual MACC festivals from 2006 – 2011 with the exception of the song “Life Goes On” that was recorded at Randy Kohrs’ Slack Key Studio in Nashville, TN. The label recently released a new video of the song that can be viewed on the Musicians Against Childhood Cancer website BluegrassClassic.com. The album also includes even more top musicians with the talents of: Lonesome River Band, Russell Moore & IIIrd Tyme Out, Marty Raybon & Full Circle, Shawn Camp, Rhonda Vincent & The Rage, The Grascals, Johnson Mountain Boys, J. D. Crowe & The New South, Gibson Brothers, Pine Mountain Railroad, Lost & Found, Bradley Walker, New Found Road, Michael Cleveland and Flame Keeper, Junior Sisk, Josh Williams Band, David Parmley & Continental Divide, Paul Williams, The SteelDrivers, Chris Stapleton, Morgane Hayes, Sierra Hull & Highway 111, Sally Connell, Dudley Connell, Don Rigsby, Blue Highway, Joe Mullins, Aubry Hayine, Kenny & Amanda Smith, Danny Paisley & Southern Grass, James King, Larry Stephenson, and many more.